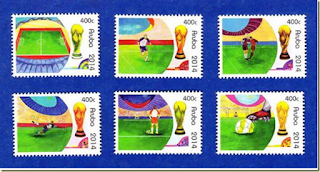 The 20th FIFA World Cup TM, was hosted in Brazil, and was the second time Brazil staged the competition. The official poster was designed by Brazilian agency Crama, and created by Karen Haidinger . The bright colourful shapes and patterns illustrate Brazil’s culture, flora and fauna characteristics. 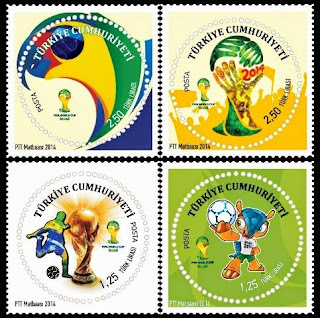 For the first time, each of the twelve cities had their own official World Cup Brazil posters with a wide and varied designs, style and colour patterns. The logo named Inspiration was created by Brazilian design agency Africa. The design contained 3 hands holding the World Cup trophy which symbolized unity, harmony and the warm Brazilian welcome to the world. The colours green and yellow defined Brazil, which reflect the colours of the national flag. 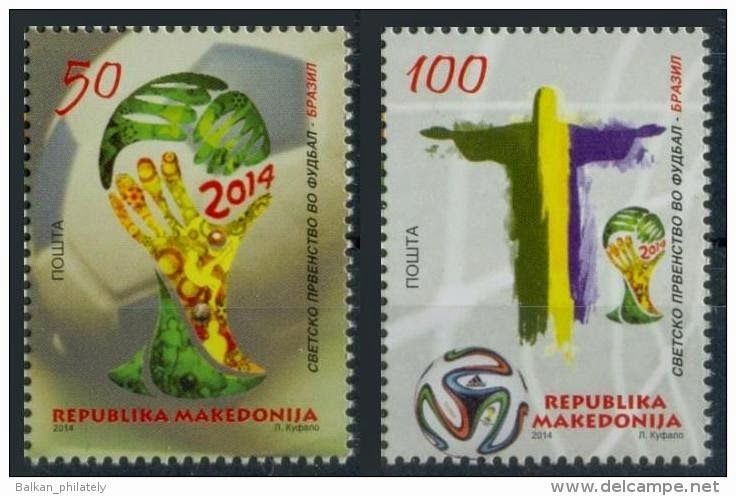 Brazil met Croatia in the opening game played in front of 62,103 spectators . Brazil came from behind to open the World Cup with a 3 – 1 victory over Croatia. The 64 competition matches were played in 12 venues located in 12 host cities across the country. The venues covered all the main regions of Brazil which created more evenly distributed hosting than the 1950 finals in Brazil. Rio de Janeiro (Estádio do Maracanã), Brasília, (Estádio Nacional), São Paulo, (Arena de São Paulo), Fortaleza, (Estádio Castelão), Belo Horizonte, (Estádio Mineirão), Porto Alegre (Estádio Beira-Rio), Salvador (Arena Fonte Nova) , Recife (Arena Pernambuco), Cuiabá (Arena Pantanal), Manaus (Arena da Amazônia), Natal, RN (Arena das Dunas), Curitiba (Arena da Baixada). 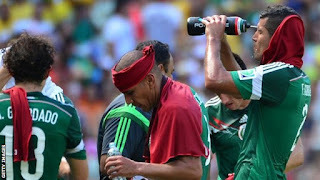 Because of the relatively high ambient temperatures in Brazil, cooling breaks for the players were introduced. Breaks took place at the referee's discretion after the 30th minute of each half if the Wet Bulb Globe Temperature exceeded 32 °C (90 °F). 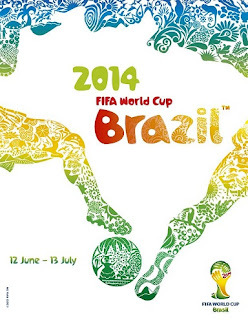 Thirty-one national teams advanced through early qualifying rounds to join hosta, Brazil in the final tournament. They were joined by: Australia, Iran, Japan, South Korea, Algeria, Cameroon, Ghana, Ivory Coast, Nigeria, Costa Rica, Honduras, Mexico, United States, Argentina, Brazil, Chile, Colombia, Ecuador, Uruguay, Belgium, Bosnia and Herzegovina, Croatia, England, France, Germany, Greece, Italy, the Netherlands, Portugal, Russia, and Spain. 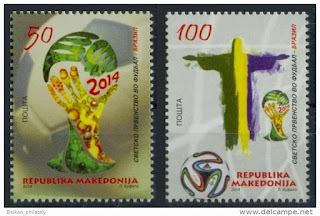 Bosnia and Herzegovina made their debut. Each team had a squad of 23 players (three of whom were goalkeepers). The 32 participating teams were drawn into eight groups of four, where each group engaged in a round-robin tournament within itself. The two highest ranked teams in each group advanced to the knockout stage. Teams were awarded three points for a win and one for a draw. 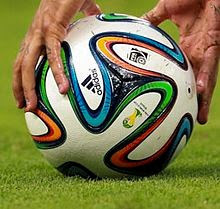 The official match ball for the tournament was the adidas Brazuca. The name of the ball was a Brazilian colloquialism for a stylish move. After criticism of the adidas Jabulani the number of panels was reduced to six, with the panels being thermally bonded. This created a ball with increased consistency and aerodynamics compared to its predecessor. There were 171 goals scored with an average of 2.67 goals per game. Brazil 2014 became the joint-highest-scoring World Cup of all time, level with France 1998. 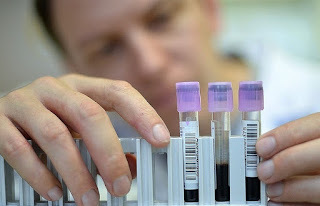 For the first time at a World Cup, FIFA adopted the athlete biological passport and blood and urine samples were taken and tested from all players before the competition, as well as from two players per team per match. The Swiss Laboratory for Doping Analysis did the analysis and despite no positive tests reported, FIFA were criticised for how doping tests were conducted. FIFA approved the use of vanishing foam by the referees for the first time at a World Cup Finals. The water-based spray, disappeared within minutes of application, and was used to mark a ten-yard line for the defending team during a free kick and also to draw where the ball is to be placed for a free kick. 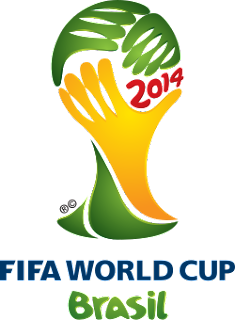 At the FIFA World Cup TM 2014 Goal Line Technology (GLT) was used for three (3) incidents which were successfully resolved. The new analysis system was allowed after the Laws of the Game were altered to accommodate use of the new technology. The FIFA Quality Programme for GLT Testing Manual precisely defined the requirements of the systems and four basic requirements of the system were stipulated: The system must address only the matter of whether a goal has been scored or not; The system must be accurate. ;The system must indicate the scoring of a goal immediately, confirming this within one second; and The system must communicate its information solely to the match officials (via vibration and visual alert on the referee's watch). The chosen Goal Control system featured 14 high speed cameras, 7 directed to each of the goals. 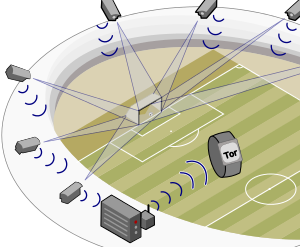 Data were sent to the central image-processing centre, where a virtual representation of the ball was output on a widescreen to confirm the goal. The referee was equipped with a watch which vibrated and displayed a signal upon a goal. 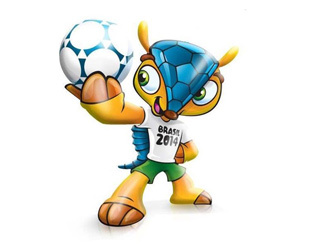 The Brazilian mascot proved to be the most one of the most popular World Cup mascots, in no short measure because of his high presence at all 64 matches and in many FIFA Fan Fests across Brazil, entertaining the fans on and off the pitch. He was the ambassador voice of the Waste Management campaign in all 12 stadia which collected 416 tonnes of waste. Fuleco™ has also been very active on social media reaching over 1.3 million online fans. To promote the competition, One Ball, One World was a short film produced by Spirit of Football. It traces the ball on its 6 month' travel from Battersea Park, London through 25 countries in Europe, North, Central and South America to the 2014 World Cup in Brazil. On its journey, more than 18,500 people kicked, headed and signed The Ball including the President of Honduras; indigenous people; church groups; homeless; gay, lesbian, transgender and straight people; university students; prisoners; thousands of boys and girls; a 97 year old woman; Army Generals and soldiers; Donald Duck; many world famous current and former football players; refugees; and hundreds of Special Olympics athletes. The soundtrack is titled Beautiful Game by New Model Army. Spirit of Football's education program "One Ball, One World" accompanied The Ball's journey and thousands of people heard The Ball's stories and joined us in a celebration of integration. The Ball 2014 was hand made in Franco da Rocha Prison near São Paulo, Brasil. Beats by Dre , a division of Apple, promoting headphones, released the music video, ‘The Game Before the Game,’ which was not an official commercial for the FIFA World Cup did rather hijack the attention. Beautifully shot, the film highlighted pre-game rituals, of Neymar Jr (talking to his father ) , Goetze, Sturridge, Fabregas (kisses the ring his girlfriend gave him four times), Suarez (kisses his son and daughter’s names tattooed on his wrist), Javier "Chicharito" Hernandez (prays on his knees) , Van Persie, Schweinsteiger, Altidore, Sagna, and Matuidi, among others . The film also included some of the world's biggest celebrity football fans: LeBron James, Serena Williams, Rio Ferdinand, and Thierry Henry. As before many countries around the world released postage astamps to commemorate the FIFA World Cup TM 2014 in Brazil. In India, Prime Minister Shri Narendra Modi addresses pfficially launched India's commemorative postage stamps in New Delhi. 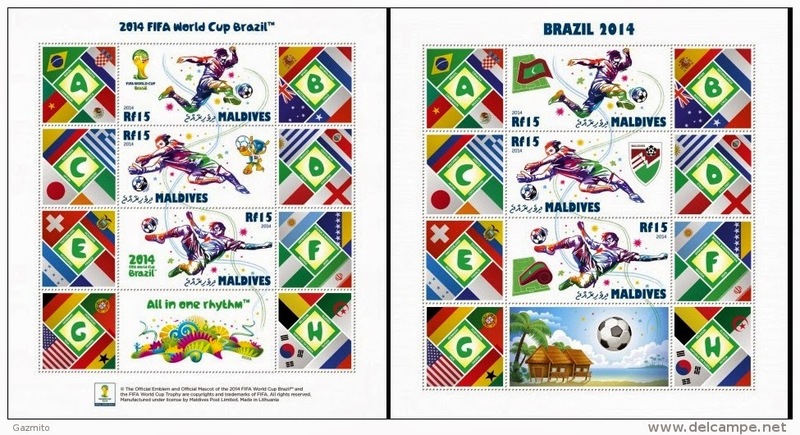 2014 FIFA World Cup Brazil was the official video game for the 2014 FIFA World Cup TM , and was published by EA Sports for the PlayStation 3 and Xbox 360. Unlike previous FIFA World Cup tie-in video games, the game was only available on a few platforms. 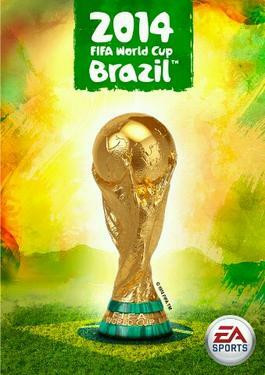 It was also the final FIFA World Cup video game to be released as a standalone title. Gameplay improvements from FIFA 14 include dribbling, an increased accuracy in passing and first-touch mechanics. Additionally, the game featured EA Sports Talk Radio, where players choose one of three channels, each featuring a pair of pundits commenting on user-controlled teams' progress and answering e-mails, texts and tweets. 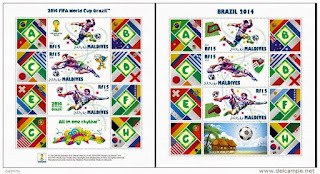 The 32 teams were split into eight groups of four, labelled A–H. Group A and each team played three games. The group stage produced a total of 136 goals (an average of 2.83 goals per match). This was the largest number of goals in the group stage since the 32-team system was implemented in 1998 and the largest average in a group stage since 1958. Brazil and Mexico advanced to the knock out stage (Group A); The Netherlands and Chile progressed to the knockout stage, eliminating the reigning champions Spain as well as Australia (Group B). In Group C , Columbia and Greece topped the pot ; Underdogs Costa Rica topped the group undefeated, and were joined by Uruguay sending England and Italyhome (Group D). In Group E, France and Switzerland went through; Argentine and Nigeria advanced to the next stage (Group F); Germany and United States saw Portugal and Ghana return home (Group G); In Group H, it was Belgium and Algeria that proved the victors of their pot. All of the group winners advanced into the quarter-finals. Five of the eight matches required extra-time, and two penalty shootouts were needed to complete the round of 16. The goal average per game was 2.25. In the Semi Finals, Brazil were drawn with Germany and played at the Estádio Mineirão, Belo Horizonte in front of 58,141. 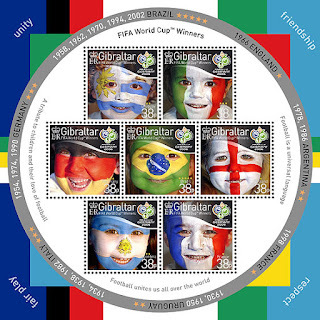 The Germans set a World Cup record with four consecutive semi-final appearances and thrashed Brazil 7–1. The Netherlands drew Argentina and were beaten 2-4 after penalties at the Arena Corinthians, São Paulo (Att: 63,267). In the final, watched by over one billion viewers worldwide, Germany defeated Argentina after extra tine, 1–0 to win the tournament and secure the country's fourth world title.